Alfred Hitchcock, before he began directing films in 1925, was active as an art director. He entered the industry in 1919 when he was employed by the Islington studio location of Famous Players-Lasky and he worked as an art director on at least six films before moving on to directing. Hitchcock’s lifelong interest in production design has often been understood in light of his experi ences at German studios both in Berlin and Munich and his exposure to German expressionism. 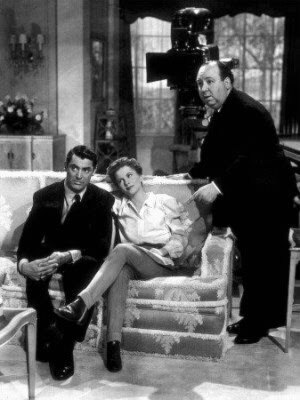 Hitchcock’s first project for RKO Studios had been a comedy and with his next assignment he was given the opportunity to pursue a subject in keeping with his earlier darker films. Suspicion (1941) was notable for first introducing actor Cary Grant and director Hitchcock, and for using art d irection as a psychological element in storytelling. The contrast between Lina’s (Joan Fontaine) reassuringly stuffy family home and the coldly menacing home she shares with husband Johnny (Grant) personifies the tension of her state of mind. The film’s art direction, supervised primarily by Carroll Clark, is also noteworthy for using the human form as an architectural element. 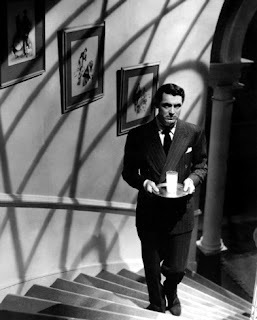 The tall and solid form of Cary Grant balanced on the stairs is echoed in the equally tall and solid column at the foot of the stairs. The graceful line of the pinstripe in Grant’s suit is echoed, but altered, in the equally graceful lines of the treads and risers of the stairs. These lines are further mimicked in the lines falling across the wall and surrounding Grant’s head. 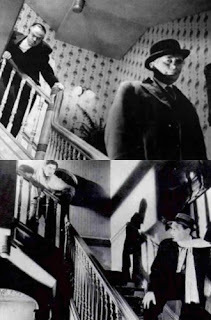 The elements confirm and confuse by communicating both Grant’s guise of reliability and the shadow of suspicion regarding his motives, all combining to create one of the most emotionally menacing sequences in the film. Van Nest Polglase is credited with supervising art direction on what is considered the finest film ever made in America. However, the credit for most of the innovative art direction rightly belongs to Perry Ferguson. Many film scholars have written in depth on the making of Citizen Kane (1941), with a focus on cinematography and the use of lighting, but few focus on the contribution of art direction. Pauline Kael, film critic and author of The Citizen Kane Book, mentions neither Polglase nor Ferguson. Orson Welles, in trade paper ads the day of the film’s Hollywood premiere, gave thanks “to everybody who gets screen credit for Citizen Kane and thanks to those who don’t.” Considering the risk involved in screening the film, this was a generous acknowledgment of the work of many creative individuals. Although Welles appears to have refused to acknowledge Polglase’s contributions, he praised Perry Ferguson’s historical details stopping short of giving Ferguson his due credit on the film. Ferguson’s use of revers al of scale as Kane’s ambitions move from larger than life to dwarfing the man who created the illusion is one of the film’s benchmarks and an example of RKO’s sophisticated art direction. A comparison of Citizen Kane with a lesser film in production the same year proves the level of RKO’s emerging visual style. Stranger on the third Floor (1940) was a minor B-film that caused no great stir at the time and could have easily disappeared to the dustbin. Some film historians claim the film contains the first examples of what would later be termed noirish elements (but this is open to debate). 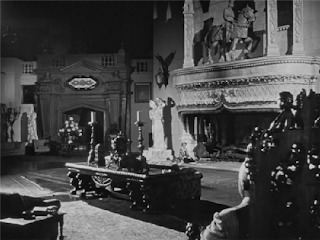 Compare the two films for their remarkable similarities: the often dream-like quality, elaborate sets, oversized props and the exaggerated reversal of perspective found in both is significant. The photos to the right show a scene from each film that again reveals a stylistic use of the human form in an architectural environment, and nearly duplicates the body language of the lead character poised at the top of the stairs. Two different art directors created the design of these films, but the designs were produced under the guidance of Van Nest Polglase and RKO art direction. Polglase left RKO Studios as head art director in 1942 and divided his time between freelance and studio projects before retiring fifteen years later. His film credits during this period include The Fallen Sparrow (1943); A Song To Remember (1945); Gilda (1946); Slightly Scarlet (1956) and B-films directed by Allan Dwan. In February of 2005, the The Art Directors Guild unveiled its new Hall of Fame and inducted the following legendary production designers at the ninth annual Art Directors Guild Awards: Wilfred Buckland, Richard Day, John DeCuir Sr., Anton Grot, Boris Leven, William Cameron Menzies and Van Nest Polglase. A trend in film criticism seems to have developed regarding Polglase’s contributions to RKO’s art direction, dismissing them as negligible at best. An unfair appraisal of Polglase may be due to the assumption that he ran his department based on his experiences at and observations of M-G-M and Cedric Gibbons. 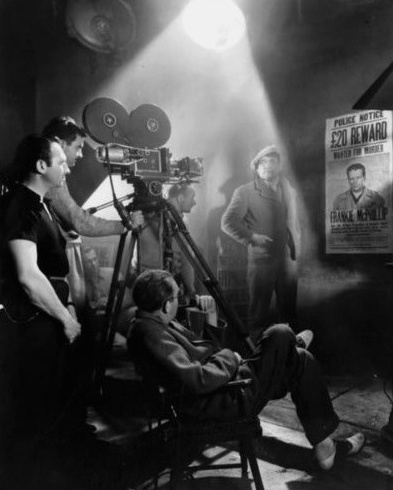 Richard B. Jewell, film historian and author of The RKO Story states, "The supreme irony of RKO's existence is that the studio earned a position of lasting importance in cinema history largely because of its extraordinarily unstable history. Since it was the weakling of Hollywood's 'majors,' RKO welcomed a diverse group of individualistic creators and provided them...with an extraordinary degree of freedom to express their artistic idiosyncrasies.... [I]t never became predictable and it never became a factory." Jewell’s assessment that RKO was a studio of artistic freedom did not preclude conflict over creative control. David O. Selznick, the man responsible for Polglase being made head of art direction, left the studio after a brief fifteen months. Polglase remained with the studio for ten years as an administrator and art director, successfully filling both roles with films that satisfied audience demand for inventive entertainment and studio executives’ demand for new revenue. A change of perspective from Polglase taking credit for work he did not do would result in his making possible the outstanding work of art directors Carroll Clark and Perry Ferguson. There are many elements that form a link between architecture and art direction. The difference between the two disciplines is where architecture “encompasses” space from without art direction “evokes” space from within, and the architecture of film works within cuts and edits, frames and openings. The architect designs a space with an eye to permanence while the art director designs a space with an eye to the ephemeral. This leaves the art director a greater sense of flexibility when creating his projects unfortunately; the architect and the art director both depend on the efforts of preservation to maintain a permanent record of the artist’s original vision. Gypsy...thank you for contributing an immensely intelligent and instructive Pt. II; together with Pt. I you have created a comprehensive view of Van Nest Polglase. Your thoughtful and wide ranging piece manages to encompass not only Polglase's career, but also his role in RKO's developing visual style, specific examples and analysis of elements of art direction on several films, the relationship of art direction and architecture and so much more. I plan to take a look at Stranger on the Third Floor with an eye toward comparison with Citizen Kane, as you suggest. Your work on these two blogs is truly masterful, thank you again. Outstanding piece, Gypsy. Your research into this material combined with your knowledge of technique and design makes for an insightful and very interesting article. When I was a kid, I never thought of movies except in terms of the actors. My mature sense of movies is quite different -- actors are a part of an incredible group of talented filmmakers, without whom we would have Cary Grant carrying milk up a boring, normally lighted staircase, or Charles Foster Kane leaning on a bannister like a man standing at a bar, all without depth or sense of drama My personal preference for black and white movies is based upon the incredible range of atmosphere and emotional reaction that it makes possible. I hope you do more of this type of overview. I would be first in line to read your wonderful pieces. excellent work,karin..shifting thru all the details of HOLLYWOOD myths and disinformation...kudos and more kudos..would you consider doing WILLIAM CAMERON MENZIES...PERHAPS!! 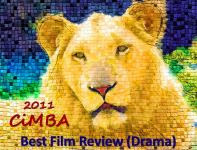 Eve, Becky and Thomas it is so nice to hear from each of you; thank you for your enthusiastic feedback. No matter how much research I did on Van Nest Polglase, short of having access to his personal and studio archives it was nearly impossible to get a true idea of the man. This is why I found it so funny that one publication referred to actress Dolores Del Rio as “Mrs. Van Nest Polglase,” when in fact she was married to Cedric Gibbons, M-G-M’s head of art direction. Whistlegypsy, Thank you for your wonderful two part article about Polglase’s contributions to the movies.. Thank you W-G for this outstanding and perceptive examination of the career and contributions of Van Nest Polglase. That elegant Georgian house in Suspicion is one of my favorites - very subtle in its creation and use of mood - a great film! Thanks again! I have an interesting farmyard sketch drawn by Van Polglase when he was in the Motion Picture Hospital (Woodland Hills)in the mid 50's. He gave it to my mother-in-law for cigarettes.